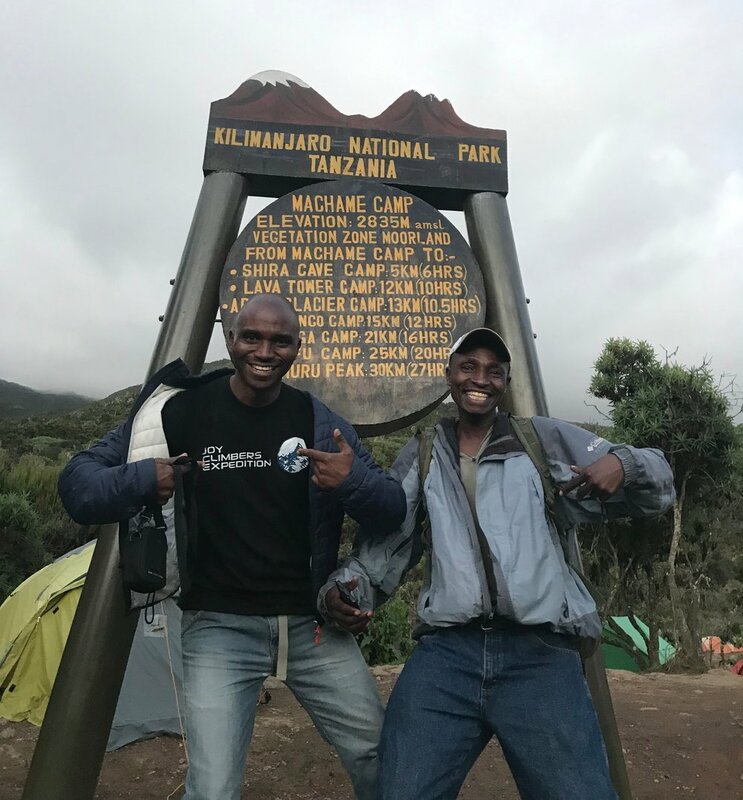 Climbing Mount Kilimanjaro — Hello Adventure Co.
Our group of 6 set out to climb to the tippy top of Africa with Joy Climbers Expedition. We have all had Kilimanjaro on our to do list for years, and finally made our dreams a reality with a lot of positivity, determination, and of course the obligatory album drops at every camp. I had quite a few questions about our how we got to Arusha, and our route was surprisingly easy! We flew directly from our home cities to Amsterdam, then connected on KLM’s non-stop to Kilimanjaro International Airport (JRO). When we landed it was late, and the Joy team was ready and waiting for us with a sign. Our airport transfer was included in the trek price to and from, which was much appreciated as the airport is an hour from town! We were all exhausted from a long travel day but couldn’t wait to wake up and check out our surroundings. After a quick hotel breakfast, we went out to wander the busy streets of Arusha and gather a few last minute items as well as hang out with the sweetest children. We were then able to meet our guides, Florence, Said, and Gasper. We finalized all of our plans, and did our gear checks. If you didn’t have every item on the packing list, you had to rent it, or buy it. Joy luckily offers a variety of gear to rent such as sleeping bags, trekking poles, summit jackets, etc. A few packing regrets within the group: fleece pants, down booties, nail brush, and nail clipper. Overall, we were pretty prepared (overly prepared?) and ready to do the dang thing! Pole = Slowly in Swahili. We quickly realized that if we weren’t going pole pole, we would end up poorly poorly. So pole pole it was. Our first day was great; the terrain wasn’t too hard, but it was a gradual gain. The rainforest was beautiful – filled with massive, lush green trees and plants, elephant trunk flowers, vines, even a few monkeys. We ended day one at Machame Camp! Our numbers for the day were 11km and 4,000 feet of elevation gain. We slept at 9,000 feet. After arriving at camp 1, we got organized in our tents, were given hot water for “washy washy”, and then had happy hour consisting of tea, hot chocolate, peanuts and popcorn while we waited for our “stomach engineer” to prepare dinner. This became a nightly ritual. Our dinner that night was zucchini soup, fish, potatoes, curry, veggies, and fruit salad. We had one veghead in the group and Joy did an excellent job making sure she was accommodated every night. After dinner we briefed for day 2, took a few photos of the stars, and passed out. We were eager to hit the trail again today, this time hiking through the Moorland section of Kilimanjaro. Instead of the thick forests we were hiking through yesterday, we spent the day hiking through boulder fields and river beds.We caught a few beautiful glimpses of Mt. Meru, and passed our first waterfall. Shira camp sits at 12,500 feet, it took us about 4 hours to get there. After we dropped our things at camp and dropped an album, we did a short acclimatization hike before dinner. The acclimatization hike was followed by happy hour, and tonight our porters were singing traditional songs and dancing for us. It didn’t take long before we were out there joining them. All of their moves beat ours, as expected. For dinner we had a creamy potato soup and bread, coconut rice with curry, fried chicken, cabbage salad, and fried plantains. After dinner the clouds parted and we were able to get our first glimpse of Kilimanjaro, alpenglow and all. What a babe. After gushing over Kili, our guides checked how we were feeling by checking our blood oxygen levels, pulse, and lungs. We were all between 82-97% o2. At this point, none of us had any altitude sickness symptoms which was relieving as this is where many people begin to feel nauseous, get severe headaches, and vomit. After health checks the cold temperatures were setting in and we were all ready to cozy up in our sleeping bags and crash. Another favorite phrase of theirs. Pro snacker tip: HUPPY BARS. YUM. The founder of Huppy climbed Kilimanjaro years ago bringing her own variation of her now Huppy Bar(s) up the mountain for a healthy, sustainable snack. These all natural fruit and nut bars were loved by all of us and gave a noticeable boost of energy. Adventure inspired nutrition = the best. Day 3 was a long one! We hiked through the “arctic desert” area of the mountain. From Shira, we went up a ridge, passing the junction towards the peak of Kibo. We went up and up and up, headed towards this massive lava tower, called the “Sharks Tooth”. We were at about 16,000 feet shortly after, and then we descended to Barranco Camp, which sits at 13,000. Hike high, sleep low!!! It took us about 7 hours to get from camp to camp. Our bodies were tired after today. It was snowing, we were all pretty cold, and one of us began to suffer from the altitude with an intense headache. We had washy washy, skipped happy hour to warm up, ate a quick soup and spaghetti dinner, checked our vitals once again, and crashed. Hard. Pro tip: the park ranger will charge cameras, phones, GoPros, Apple Watches, whatever for about $11,000 shilling and a big smile. After sleeping like fat babies, we had our tentside coffee, a quick breakfast, and were only a few minutes behind this time. 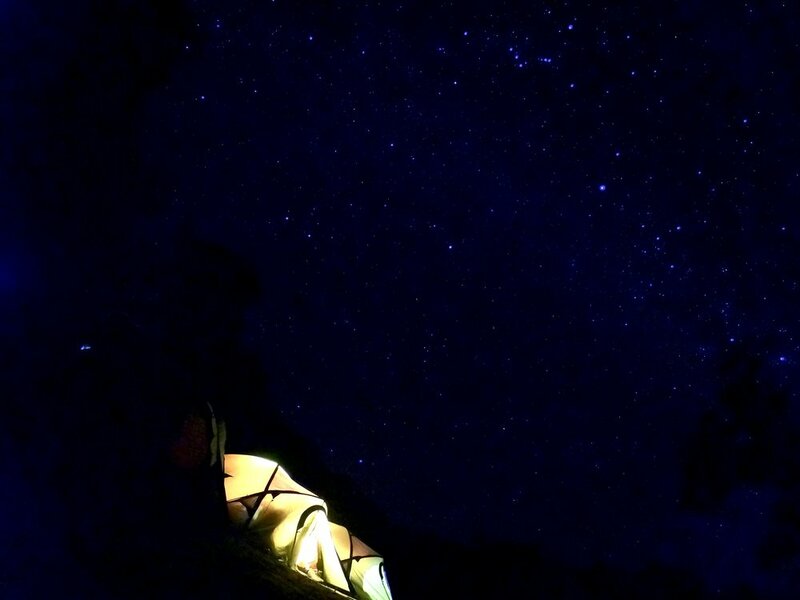 We unfortunately knew what we were getting into, as camp was situated a few thousand feet into the canyon we descended into the night before. We were climbing the Barranco Wall, which thankfully looked more intimidating than it was. We crushed the wall out in about 2 hours, and were rewarded with incredible views of Kilimanjaro. The highlight of our day was hiking next to the Giant Dendrosenecio trees, which are only native to the Kilimanjaro area, growing along a permanent stream in volcanic rock. They look like a cross between an oversized pineapple and a cactus. So unique, definitely a tree’t to walk among them! We set up camp at Barafu, sitting at 15,300 feet. We have officially completed the south circuit at this point! Stats for the day were 9km and 8 hours of hiking through the alpine desert. We were all equally excited and nervous as to what the next 24 hours would bring. We ate a filling dinner, checked our vitals, and went over our summit game plan. At this point, it was 7pm, and we knew our wake up call was 11 pm to begin our journey up, so Florence and Said kept it short and sweet. They congratulated us on how far we have already come, and reminded us that “together we can” – our favorite phrase of the trip. Summit day is finally here! After our brutal wake up call, we had tea and crackers in our tents, filled our bladders and Hydroflasks with hot water, put new batteries in our headlamps, and hit the trail going verrrryyyy pole pole. The weather gods were in our favor thankfully; the stars were out and brighter than I had ever seen them, and there were no clouds in sight. The summit terrain on Kilimanjaro is considered arctic; the temperatures were around 5 degrees at basecamp. We all had 3-4 bottom layers on, 4-5 top layers on, double socks, foot warmers, hand warmers, two hats, two buffs, fleece lined gloves, and waterproof shells on. We started our ascent through heavy scree fields towards Stella Point, which is on the crater rim. We were hiking between the Rebmann and Ratzel Glaciers. About an hour in, our water bladders and snacks were frozen, two of us were vomiting every 30-40 minutes, and a few of us had horrible headaches. It was much more than a physical challenge. By hour 5 we were exhausted. We were over halfway at this point, but we were losing feeling in our fingers and toes, running out of water, sick, and a few of us cried. Our guides stayed positive and encouraged us to continue, they even carried our day packs. Everyone was suffering in some way, and although we were determined as ever, quitting crossed our minds more than once. The sun finally started rising when we were about 15 minutes away from Stella Point (18,600!) and we were rewarded with incredible views. After hiking straight up for 7 hours in the dark in below freezing temps, I had an entirely new appreciation for feeling the first rays of sun on my skin. The air was icy and cold but there was no wind, the dirt and scree was glowing red, the glaciers were pink, and our frosted backpacks were glistening. Golden hour magic. From Stella, we all made the decision to continue on to Uhuru, the true Kilimanjaro summit. Since some of us were in rough shape due to the altitude, a few tests had to be done to make sure we were healthy enough to continue. We were all cleared and 45 minutes later, we were at 19,345 feet and had all SUCCESSFULLY SUMMITED! We didn’t spend very much time at the top as the sun was already strong and it was -16F. We took a few photos and descended as quickly as possible to alleviate altitude sickness symptoms. Everyone talks about the slow sufferfest / type 3 fun summit push, but no one talks about the descent back to base camp… it. was. tough. Moving as fast as you can descending down steep scree fields is anything but fun and definitely not graceful. Once back at base camp, we all collapsed into our tents and our guides let us sleep for an hour before having a large hot meal and descending another 5,000 feet to Mweka, which seemed like another never ending descent. Overall, this was the most physically and mentally demanding day any of us had ever had. Stats: 6km ascent, 12km descent. 8 hours to summit, 2 to descend back to base camp, and 3 more to descend back to camp for the night. In total we gained/lost 13,345 feet. Our bodies were wiped. WHAT. A. DAY! Together we can turned into together we DID. Pro snacker tip II: Fourpoints Bars - not only are these tasty bars a healthy, sustainable snack, they DONT FREEZE!!! They are plum based (and delicious) and when every snack in my pack was frozen solid at summit, this was the only snack I could rely on. Backcountry Banana Bread and Powderday PB&J were my personal favs. Pocket snack at its finest! We really slept like fat babies this night — all of us were asleep by 8pm. Our last morning was a bittersweet one for all of us, trying to still comprehend what we just accomplished, excited that it was ending but also not ready to let it end. After breakfast we had a tipping ceremony — the porters and guides sang the now unforgettable “Jambo” song, which is a traditional joyful song of the mountain, always accompanied by clapping, some dance moves and the entire crew singing. After the ceremony we gave hugs and said our final goodbyes to the porters. Good human tip: although the porters are paid fairly, many of them are very poor and can not afford quality gear/have access to quality gear. If you’re planning a trek to Kilimanjaro, throw a few extra hats, buffs, gloves, even wear a pair of boots you plan on leaving and give them away when you’re done. We gave them all of our extra snacks, hand warmers, a few new beanies, buffs, socks, and a pair of boots. They were incredibly appreciative. We hiked through the rainforest again and went down down down. It took us about 4 hours to go 10k; we were insanely sore from summit day and pole pole was in order. Once back at the park entrance, we were met by the Joy vehicle and team, were given certificates, and congratulated once again. We made a quick stop for some souvenirs, bought beers for the porters, and had an epic dance party on the bus. When we finally got back to the hotel, we had pizza and long overdue showers. The guides came back a few hours later and we took them out for beers. They rented us a van and took us to a karaoke bar! After a fun night out we said our final goodbyes, (easier as a see ya later), and thanked them 100 times over. Asante Sana, Joy team. Thank you for the incredible experience and for making our trek a successful one. - Not knowing how your body will react in altitude is dangerous. Prior high altitude exposure or altitude training is necessary before this trek! Most people opt for a longer trek (8-10 days) because this gives your body the additional time it NEEDS to acclimate. If you don’t have time to climb high and adjust before the trip, Joy offers a multi-day acclimatization hike on Mt. Meru and you can crush that out before attempting Kilimanjaro. - In order for our bodies to acclimate properly on an accelerated climb, trekking pole pole, proper hydration, hiking high, and sleeping low all went hand in hand to get the job done. We were drinking no less than 3.5L a day, some days drinking around 6L each. Nuun, Zipfizz, Liquid IV, our Hydroflasks, and Osprey bladders got us through. - Get a Yellow Fever shot before you come to Tanzania! They are good for life. - Clip your toenails before summit day, even if you just got a fresh pedi. You’ll lose them otherwise, 9,000 feet of descending is no joke! - Diamox. Take it. It typically comes in 250mg tablets, so take half in the morning and half at night. This will help your body naturally acclimatize but does come with some funky side effects. - The glaciers covering a large portion of the crater rim at the summit of Kilimanjaro are shrinking and predicted to vanish completely within the next few years, meaning there is no better time than now to climb – it’s a sight that you don’t want to miss! - The bathrooms can get a little sketchy along the trail. One way to steer clear of them: hire an extra porter to bring you a portable.